In this month’s Digitizing the Long Civil Rights Movement update, we are happy to announce that initial scanning for all of Duke’s manuscript content in the Content, Context, and Capacity Project is complete. Over 66,000 scans are now either published or are being processed to enable publication as soon as possible. We encourage you to check out the CCC Content Page as a portal for looking at all of Duke’s CCC Collections as well as those digitized by NC State, UNC-Chapel Hill, and NC Central. Meanwhile, we are beginning work on digitizing the audio oral histories from North Carolina found in the Behind the Veil Collection, which will be our primary focus during the upcoming third year of the grant. 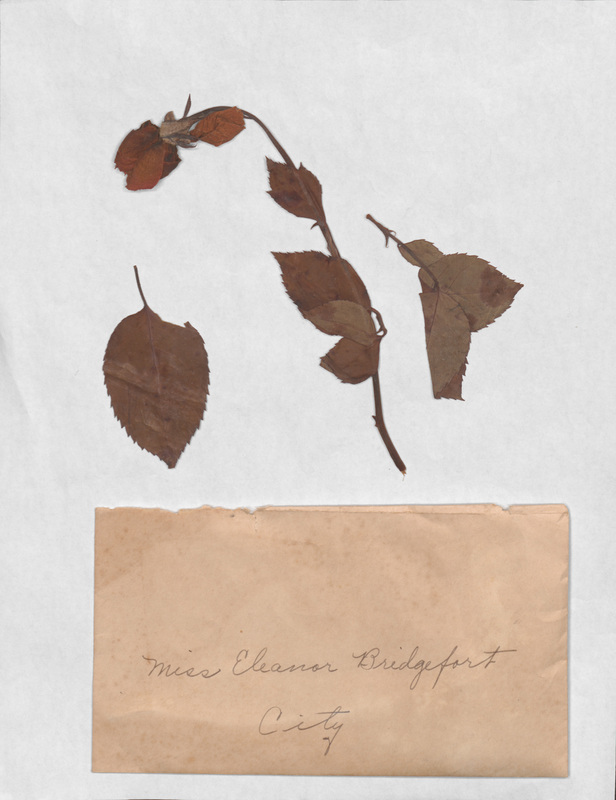 For our collection highlight this month, we turn to the Charles N. Hunter Papers. Born to enslaved parents in Raleigh in 1851, Hunter would go on to become one of the most prominent African-American educators and advocates in North Carolina. Aside from industrial activism and prolific writings, Hunter served as a teacher and principal at several schools, mostly in the Triangle and its environs. As part of that work, he corresponded with the Tuskegee Institute and its founder, Booker T. Washington. Letter, Booker T. Washington to Charles N. Hunter, July 7, 1914. Charles N. Hunter Papers, Box 2, Folder 2, Item ID: cnhms02002037. Click to enlarge. 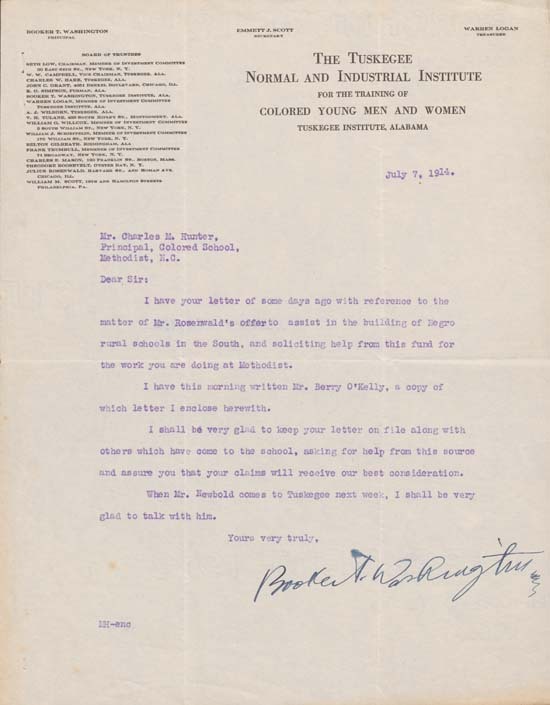 The letter shown here is from Booker T. Washington to Charles N. Hunter. Written in 1914, it concerns a project, led by Hunter, concerned with building rural schools for African-Americans throughout the South. Hunter worked with Washington and the Tuskegee Institute for this project and continued to correspond with the institute after Washington’s death in November 1915. Given Hunter’s work with Washington, it is appropriate that the last school at which he served as a principal was Booker T. Washington School in Johnston County. The Charles N. Hunter Papers, and other CCC Collections, will be published in the coming months. For more information on the CCC Project, please visit our website or like us on Facebook. 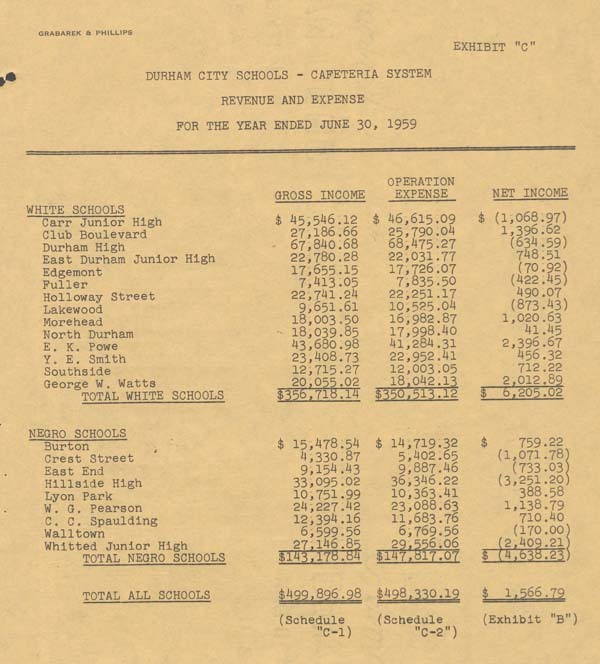 This month’s Digitizing the Long Civil Rights Movement update pauses to look back into Duke’s own past struggles with racial equality. 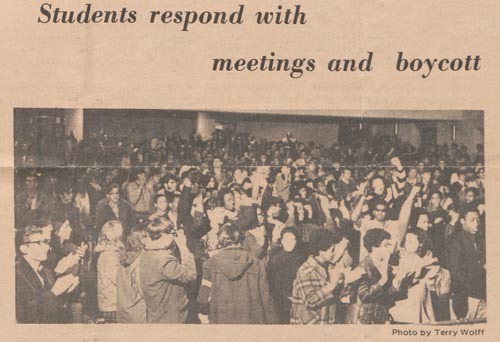 On February 13, 1969, students in the Afro-American Society occupied the Allen Building where the university’s primary administration offices were (and still are) located. These students demanded that Duke take steps to enact racial equality on campus, including the founding of an African-American Studies department, the hiring of more African-American professors, and the establishment of an African-American cultural center on campus. Similar demands had been made before from members of the Black Studies Program, as featured in our fourth update in this blog series. What distinguished the Allen Building Takeover from the previous efforts for reform was its forcefulness—on both sides of the debate. The Takeover marked the first such occupation by students in Duke’s history. The administration’s response also became notable for what some members of the student body perceived to be its brutality. Police officers dispatched to the scene used tear gas to disperse a crowd that had gathered around the building, leading to a “riot” on the main quad of West Campus. Both photos from The Chronicle, February 16, 1969. In the wake of the Takeover, students rallied to enact the suggested agenda of the original occupiers. 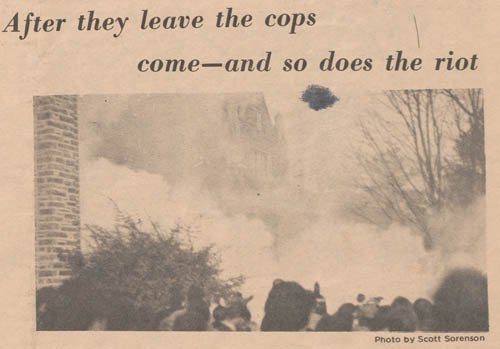 Eventually, most of the demands did become standard practice at Duke, but the change occurred more gradually than what the galvanized student body had wanted in February 1969. The items selected above are from a photo essay published by The Chronicle (Duke’s independent student newspaper) that encapsulated the events of Takeover. We are happy to announce that the Allen Building Takeover Collection and its wealth of primary documents and remembrances of the important event will soon become available online to researchers. For more information on the Content, Context, and Capacity Project for Digitizing the LCRM, please visit our website or like us on Facebook. Unsigned letter about CORE, November 7, 1963. From the Duke University Union Records. CORE, the Congress of Racial Equality, was an interracial civil rights organization that, according to its website, began as “a nonhierarchical, decentralized organization funded entirely by the voluntary contributions of its members.” By the early 1960s, chapters and projects existed in many states and were self-funded and self-led. The early 1960s were a pivotal time for CORE chapters, particularly those throughout the south. 1960, of course, saw the Greensboro sit-ins, and CORE was instrumental in formulating responses throughout the region. In 1961, CORE chapters, the Student Non-Violent Coordinating Committee (SNCC), and other civil rights organizations both participated in and organized “Freedom Rides” throughout the segregated south in order to desegregate interstate travel. And during 1964’s Freedom Summer, CORE members James Chaney, Andrew Goldman, and Michael Schwerner were murdered in the infamous “Mississippi Burning” case. Perhaps it was something about the “nonhierarchical, decentralized” language that piqued the curiosity of Duke administrators and compelled them to check with both the United States Department of Justice and the House of Unamerican Activities Commission before approving a CORE chapter at Duke. The motivation behind such actions may have been lost to time . . . or maybe it’s buried deeper in the Union records! Post contributed by Maureen McCormick Harlow, Drill Intern for the Duke University Archives. As we approach the conclusion of 2012, the CCC Project at Duke is excited to announce that we have begun work with the last three manuscript collections that will undergo digitization for the grant. Collection reviews of the Black Student Alliance Records, the Charles N. Hunter Papers, and the Allen Building Takeover Collection are underway. At the same time, we are working on the finishing touches of the Elna Spaulding Papers, the largest collection that Duke is contributing to the CCC Project. Look for more updates on these collections in upcoming blog posts on The Devil’s Tale. For this month, we wanted to highlight a photograph that conveys the holiday spirit. We recognize that it is the season for peace on Earth, good will toward all, and (toy) firearms. If we were giving out year-end awards for the CCC Project, this photograph has to win the “Most Ironic” trophy. Normally, at this point, we would provide context that would explain exactly what this spokesman is trying to convey. Unfortunately, all that we know about this photograph is that it appeared in the Durham Herald-Sun and the photographer was Jim Thornton. 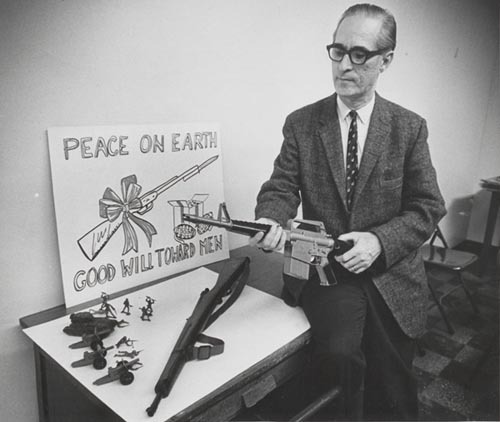 The fact that this photograph appears in the Women-in-Action records indicates that the event was some sort of anti-violence demonstration that perhaps encouraged parents to avoid purchasing violent toys for Christmas. However, this explanation is at best an educated hypothesis. No matter the explanation, this photograph and the rest of the CCC materials are quite thought-provoking. And our final thought for this update: Happy Holidays from the CCC Staff! To learn more about the CCC Project, please visit CCC on Facebook. 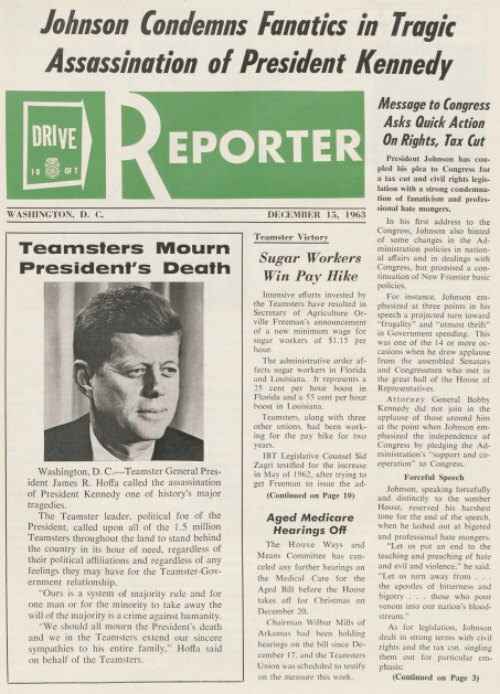 In this month’s update of the Content, Context, and Capacity Project at Duke, we examine the context of an issue of the DRIVE Reporter, a publication of the International Brotherhood of Teamsters. The first page of this issue includes a memorial to President John F. Kennedy and an article about President Lyndon Johnson’s new call for Congress to act on civil rights legislation. Immediately, two questions come to mind: Why are these issues appearing in a labor union’s publication? And why does this publication appear in the papers of Basil Lee Whitener, a Congressman from North Carolina? The first question ties to the stated mission of the International Brotherhood of Teamsters. Led by its controversial president Jimmy Hoffa, the Teamsters launched DRIVE (Democratic, Republican, Independent Voter Education) in 1959 to educate its members about labor issues and pending legislation. Both the death of President Kennedy and Johnson’s proposals qualified as issues that would affect labor in the immediate future. In addition, the Teamsters had fought for the equality of African-Americans in the workplace. Thus, the inclusion of a story on civil rights legislation made sense in terms of the scope of the Teamsters’ mission. Committee assignments explain why this publication appears in the papers of Basil Lee Whitener. 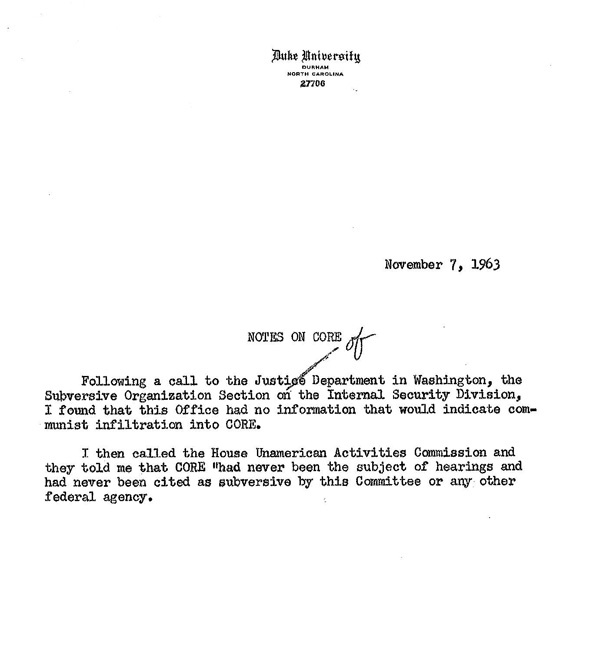 As a member of the House Judiciary Committee, Whitener reviewed the federal trial of Jimmy Hoffa that occurred in 1964. This publication, along with other Teamsters information, was gathered by Whitener and his staff as research files for the trial proceedings. If Whitener had not been a member of that committee in 1964, the CCC Project would not have access to these rich Hoffa files. To learn more about the CCC Project and how context plays a role in the history of the LCRM, please visit CCC on Facebook. We’re going to start our second update on Duke’s participation in the CCC Project with exciting news: the first three CCC-digitized collections are now available online! You can now find digitized content directly through each collection’s finding aid. Take a minute and check out the digitized portions of the Basil Lee Whitener Papers, the Rencher Nicholas Harris Papers, and the Women-in-Action for the Prevention of Violence and Its Causes Records. This month, we feature an item from the Basil Lee Whitener Papers. Whitener was a Democratic Congressman representing Mecklenburg County (N.C.) from 1957 through 1968. Like many other Democrats from the South (who collectively became known as “Dixiecrats”), Whitener was a vehement opponent of integration and any federal action intended to address civil rights issues. His papers contain a great deal of correspondence, speeches, bills, and other materials that reflect both the views of constituents regarding civil rights and how he acted in the House of Representatives to try to derail reform-minded legislation. Whitener’s opposition was firm, but such groups as the NAACP and the North Carolina Baptist Student Union sent telegrams and letters to the Congressman arguing for strong civil rights legislation. Knowing that these efforts fell on deaf ears, who then actually lobbied against civil rights legislation? The answer is the NRA . . . but not that NRA. 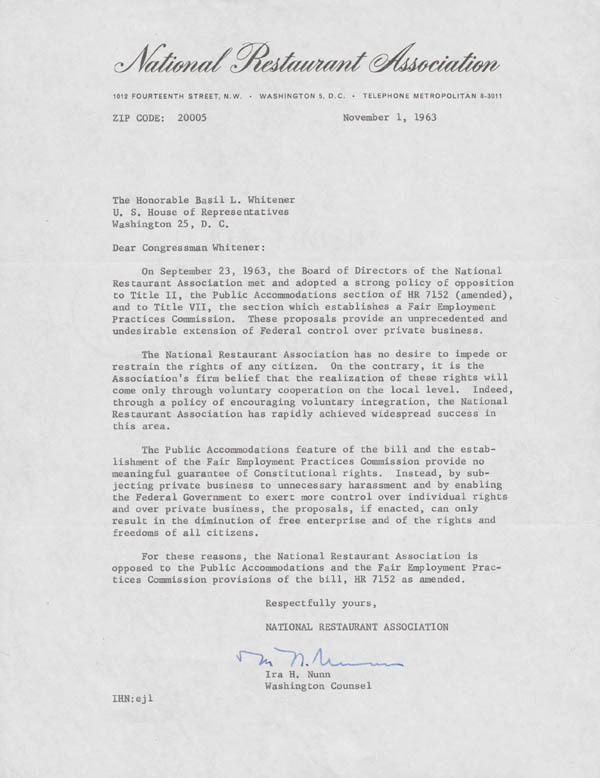 The organization in question is the National Restaurant Association; the letter that their representative Ira Nunn sent to Whitener in opposition to what would become the Civil Rights Act of 1964 is presented below. The given reason for the NRA’s opposition to H.R. 7152 was that its proposals “can only result in the diminution of free enterprise and of the rights and freedoms of all citizens.” Decode this political jargon and you will see that the NRA disapproved of the proposed ability of the federal government to mandate the integration of all public dining spaces. Instead, the NRA offered the solution of voluntary integration. In his letter, Nunn claimed that voluntary integration had been a “widespread success.” While Nunn’s claim was literally true insofar as a certain percentage of restaurant owners had chosen to integrate their establishments voluntarily, the spirit of the argument is false. Restaurateurs were not en masse choosing to integrate their establishments, especially in the South. For example, only forty percent of businesses in Greensboro were integrated by the end of 1963. Nationally, out of a possible 60,000 districts where mandated integration could have existed, only 1,000 had integrated facilities. It is understandable that Nunn would like to present his industry as reform-minded while preserving laissez-faire standards, but the historical reality does not corroborate his argument. Why would Nunn and restaurateurs more broadly oppose civil rights reform? While a culture of segregation may have contributed to the NRA’s opposition, it is much more likely that members of the NRA feared the potential loss of business that forced integration would entail, especially in the South. Therefore, at its core, the NRA’s argument against integration was primarily economic rather than cultural or social, making it stand out from most anti-integration documentation from the early 1960s. Furthermore, in an ironic twist given Whitener’s role as a representative of North Carolina, it is probable that the NRA’s economic argument was in part inspired by the events of the 1960 Greensboro Sit-In and subsequent protests across the South. In fact, such protests provided strong evidence of the social role of restaurants and the necessity for integrating their dining counters, even if the members NRA could only see the possibility of losing customers and profit. The grant-funded CCC Project is designed to digitize selected manuscripts and photographs relating to the long civil rights movement. For more information on this project, including updates on the progress of digitization, please check out the CCC website. As part of the outreach efforts of the CCC Project, monthly blog posts to The Devil’s Tale will provide updates on the latest Rubenstein Library collections to be digitized for the project. Stay tuned!